Major General Amikam Norkin takes command of Israeli Air Force, replacing Amir Eshel after four decades of service. 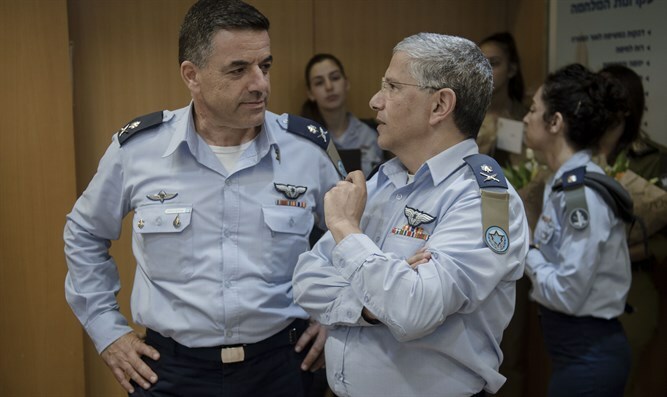 Maj. Gen. Amikam Norkin officially took command of the Israeli Air Force Thursday, replacing Maj. Gen. Amir Eshel, who held the position for the past five years and will be discharged from the IDF after 40 years of service. The ceremony was held at the 'Kirya', or IDF headquarters, in Tel Aviv and was attended by Defense Minister Avigdor Liberman, Chief of Staff Lt.-Gen. Gadi Eizenkot and members of the General Staff. "Amir, thank you for 40 years of significant contribution to the security of the State of Israel. Your years serving as Commander of the Air Force were very significant and productive, and took place in a very complex period." said Liberman. The Defense Minister told Norkin he would be faced with significant challenges in his new role, and that he would need to expand the reach of Israel's air power. "You are entering the position and will immediately begin to deal with many challenges. You will have to continue to turn the 'long arm' into a much longer arm." IDF Chief of Staff Eizenkot said at the ceremony that "Amir will finish commanding the Air Force after five years. I want to express the tremendous appreciation I have towards to Amir as a colleague at the General Staff over the years, especially for how he influenced us with his courage and creativity." "This week, unfortunately, we lost Major (res.) David (David) Zohar in an accident," Eizenkot continued, referring to Monday's Apache helicopter crash. "I think that the strength of the Air Force is also judged by its handling of tragedies." "We saw the Air Force at its best. how it embraced the family and how it always looks at the facts properly, examines things professionally, becoming a name not only in the IDF, but also in Israeli society as a whole. It sets an example for other armies in the way it investigates an incident, learns from it and attempts to have a minimum number of casualties in combat and in training."